National & state legislation imposes a duty of care to provide a safe workplace. A Changeover program will remove the requirement, and significant costs, of a pressure test. Call us today to organise a Jim’s Test & Tag Fire Safety specialist to visit your workplace in Hervey Bay. Jim’s Test & Tag is a national organisation that is committed to assisting businesses in the provision of a safe work place. We are a part of the Jim’s Group of businesses led by Jim Penman, one of Australia’s most recognised entrepreneurs. The Jim’s Group has a structured format aimed at ensuring each level provides maximum service to their ‘customers’. The Divisional Franchisor directs the operations of the Franchise and supports the Regional Franchisors. The Regional Franchisor directs the business in their area and in turn supports their Franchisees. Customers of a Jim’s Test & Tag franchisee have the backing of the franchisee’s franchisor, the divisional franchisor and the Jim’s Group. All Fire extinguisher testing provided by Jim’s Test & Tag is fully compliant with AS 1851:2012 A Jim’s Test & Tag technician performing fire extinguisher testing will arrange to inspect, test and install portable fire extinguishers. 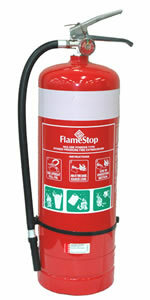 Fire extinguisher testing in Hervey Bay is performed by a trained and insured technician as per the AS 1851 standard. We will work with you to ensure that you always remain compliant. The Building code of Australia call up 1851:2012 to impose a requirement for all Fire Extinguishers to be maintained and inspected on regular basis. All Fire Blanket testing in Hervey Bay provided by Jim’s Test & Tag is fully compliant with AS 1851:2012 A Jim’s Test & Tag technician performing fire Blanket testing in Hervey Bay will arrange to inspect, test and install fire Blankets. Fire Blanket testing in Hervey Bay is performed by a trained and insured technician as per the AS 1851:2012 standard. We will work with you to ensure that you always remain compliant. The Building code of Australia callup 1851:2012 to impose a requirement for all Fire Blankets to be maintained and inspected on regular basis. Smoke Alarm services provided by Jim’s Test & Tag Smoke alarms are now mandatory in dwellings across most Australian states, with reports that they can reduce house fire deaths by up to 60%. To truly complete your smoke alarm testing it’s imperative that you ensure the unit can ‘see’ or ‘smell’ the smoke. We do this with a smoke simulation on each unit. Simply pressing the test button only ensures the alarm itself works. We will also replace the batteries whenever we test your, so you’ll never hear that annoying beep again. A Jim’s Test & Tag technician servicing Smoke Alarms in Hervey Bay, meets the requirements to undertake regular smoke alarm testing, which will give you the confidence to sleep soundly. A Jim’s Test & Tag technician can assist in ensuring your Smoke Alarms are working by performing professional testing to certify these essential saftey devices are in a state of readiness. Jim’s Test & Tag Smoke Alarms Services make the process of undertaking safety checks easy, with scheduled inspections and the provision of documented log books. All Fire Hose Reels testing provided by Jim’s Test & Tag is fully compliant with AS 1851:2012 A Jim’s Test & Tag technician performing Fire Hose Reel testing will arrange to inspect and test. Fire Hose Reels and the range of other fire services. Fire Hose Reel testing is performed by a trained and insured technician as per the AS 1851 standard. We will work with you to ensure that you always remain compliant. The Building code of Australia call up 1851:2012 to impose a requirement for all Fire Hose Reels to be maintained and inspected on a regular basis. Jim’s Test & Tag are able to supply and maintain your first aid kits. Inspection and Testing & Tagging of Electrical Appliances Jim’s Test & Tag can come to your business and undertake a full inspection and test of all appliances to ensure they are fully compliant with safety standards, helping you to discharge your duty of care for National estate regulations and more importantly, provide a safe place for your employees and your customers. Poor lighting can impact your employees health and well being. Jim’s Test & Tag is able to conduct a regular globe replacement program to ensure adequate lighting. We are also able to dispose of your globes in an environmentally friendly way and in accordance with local legislation. Microwave radiation leakage and microwave power output tests ensure that your microwave is not leaking dangerous radiation and that it is heating food to the correct temperatures. The power output test is especially important for the food industry. Residual Current Devices – Safety Switches. Our test process includes a ‘push button’ and ‘trip time’ test to help ensure that these devices provide the necessary protection. Testing of emergency and exit lighting systems is conducted in accordance with AS/NZS 2293.2:2013. Our technicians will conduct an emergency lighting discharge test and record results in your on-site logbook.